I found it amusing to learn that the name came before the concept for this week’s selection from The Baking Bible. As of Saturday morning, I had no real plans for this week’s recipe, so I figured I’d take my time making it, since we didn’t really have much in the way of plans this weekend. I made the cookie dough on Saturday morning, then left it in the fridge while Jay and I watched the Baden Santa Claus Parade from our front porch. Then we went out for a couple of hours to browse around the Christkindl Market in Kitchener. In the meantime, we both received a message letting us know that friends who moved to Toronto last year were going to be in town today and wanted to know if we could get together. Another couple offered to host, and I offered to bring the Posh Pie, not having looked at the recipe particularly closely. 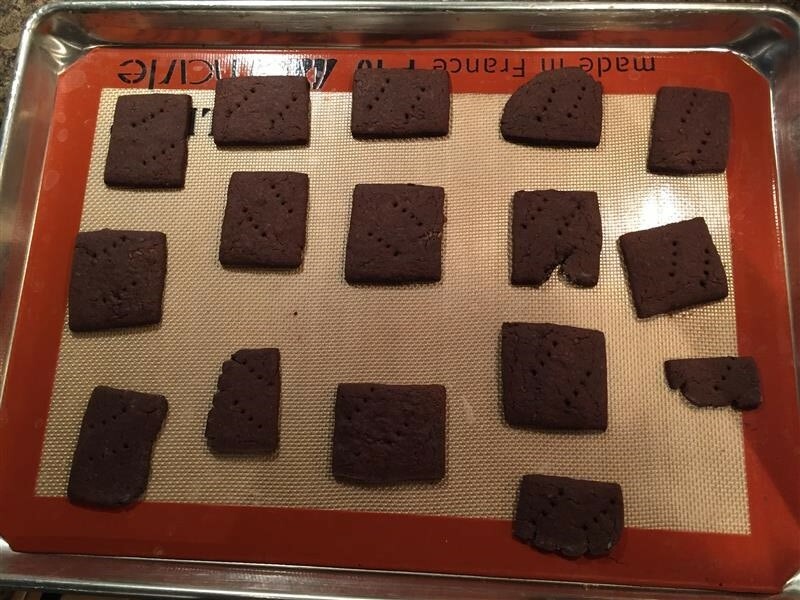 When we got home from our Christmas window shopping, I rolled out the cookies and put them in the oven before getting ready for my office Christmas party last night. This morning, I took a closer look at the recipe and realized I really should have made it yesterday, if I wanted to serve it tonight, but it seems to have worked out anyway! As I mentioned, the first step was making the cookies for the crust. One of my friends asked what the crust was, and I said, “Cookies that I made yesterday before making them into crumbs this morning.” I got a look that I think was a cross between bafflement, amusement, and kind of an “of course you did” response. 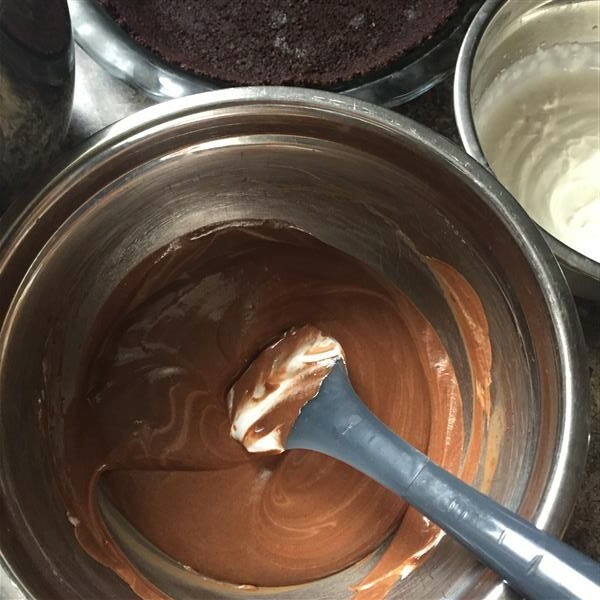 The next step was making a chocolate custard. 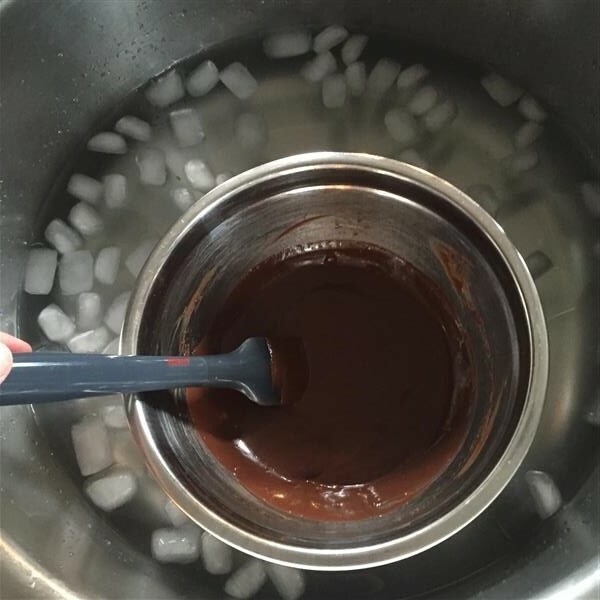 This one was supposed to take 45 minutes to cool in the fridge, stirring every 15, but instead I put it in an ice bath in the sink and had it cool within about 5. Then whipped cream, then whipped egg whites, then fold the lot together. The recipe doesn’t call for it, but I put a scoop of the egg whites in the custard to lighten the texture a little before folding in the rest. The rest of the egg whites are folded in first, then the whipped cream. I think my crumb crust was a little thick in spots, because the chocolate Bavarian cream filling really came close to the top of it. If I’d packed the crust a little thinner, it likely would have fit better. Smooth that out, then chill for “at least 4 hours.” At this point, I think it was about 10:40, and I’d been in the kitchen for about 45 minutes, after staying in bed rather unusually late this morning. 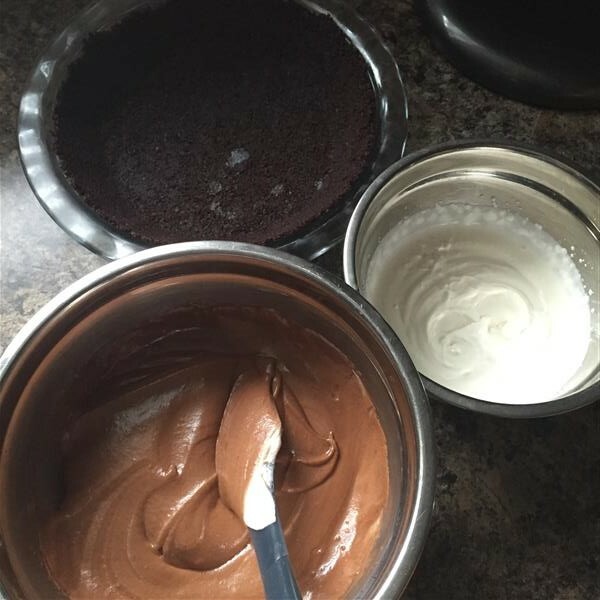 The next step is to make the chocolate lacquer glaze, and it’s only supposed to be added to the pie once it’s fully set. This topping is one of my favourites – it’s so easy, so forgiving, and makes such an elegant dessert. 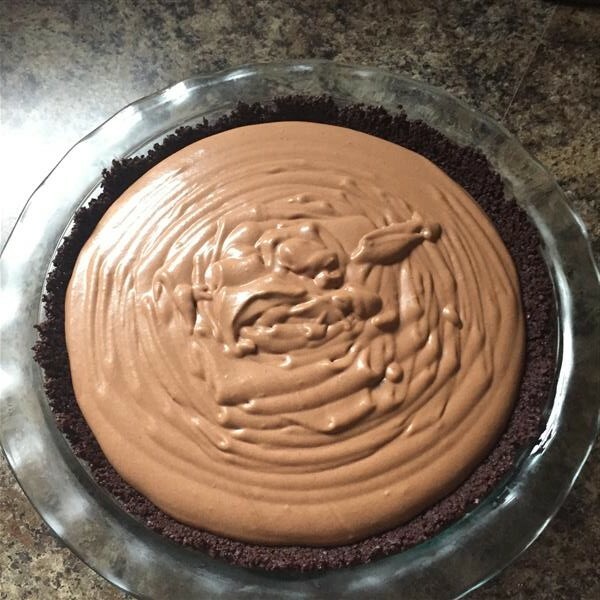 I use it on my chocolate peanut butter tart… which happens to be a favourite with the crowd that consumed this pie tonight. I poured the topping on early afternoon. The filling *might* have spent 2 hours in the fridge by then? Rushing the recipe didn’t seem to hurt anything, and the glaze seems to have set ok-ish, by 4 or so, when we got to our friends’ place. Best endorsement: our friends’ youngest didn’t eat his dinner, and his parents told him no dessert unless he ate something from his plate. He remained convinced it wasn’t worth it until his Dad gave him a “free” bite of the pie. First one’s always free, eh? After that one bite, the little guy decided it was a reasonable trade-off to go eat 5 bites of his (by now, cold) main course before he could come back and have half a piece of pie. I left the last half-piece there. 🙂 I think Jay’s hoping that I’ll make this again, but there’s always something new and interesting around the corner on the schedule! We’re now officially halfway through this book, which reminds me, I’m probably way out of date on updating my list of the recipes. I don’t think I’ve actually missed a single week that I haven’t already caught up on, this time. This year has flown by, and I suspect the next one will as well. There’s so much variety in this book that I’m not getting sick of any one dessert, and it’s still interesting to keep baking. With Heavenly Cakes, as different as all of the cakes were, they were still cakes, week after week. For the next year, I am going to have to find new ways to make sure I’m not the only one consuming these treats. There was no Movember auction this year, so I don’t have a new person to deliver treats to once a month, and 2 members of our Thursday BBQ group are soon-to-be no longer with the company. 😦 There’s still always lots of people willing to consume desserts at work, but for most of them, a Tim Horton’s donut is just fine, so I have to admit that putting a lot of effort in can sometimes feel like a waste on those who’ll just go for anything sweet. At the same time, I enjoy the process, so I guess there’s no loss regardless of who consumes it! 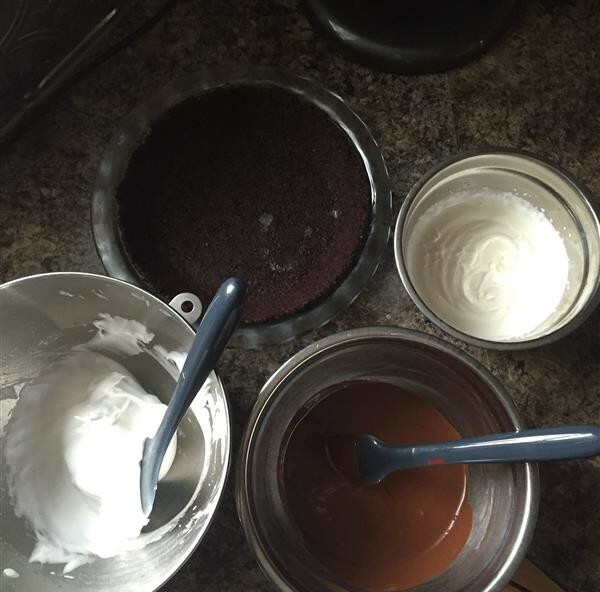 Posted on December 7, 2015 by KristinaPosted in The Baking BibleTagged bavarian cream, chocolate pie, chocolate pudding. It’s really beautiful! Since I finally gathered all the ingredients and have time to make it this morning, I’ll be trying your tips. I like the “free bite” rule. Going to pass that one along. Hi Kristina, Nice post. You pie looks perfect. An expert baker knows how to “rush” a recipe. The lacquer glaze is a spectacular, do-no-wrong covering. The La Bomba in Heavenly Cakes is where I first learned of it. A similar recipe, the two. did you receive my response about the Ice Wine Tea. I bought it at Chateau Laurier in Ottawa while at High Tea.